Incubates eggs for approximately 35 days before they hatch. During breeding season, the face is reddish and the neck is orange. Often found in large rivers and lakes inside well wooded areas. This is predominantly wetlands or swampy habitat. Reptiles, fish, frogs and large inverebrates from the wetlands where they live. 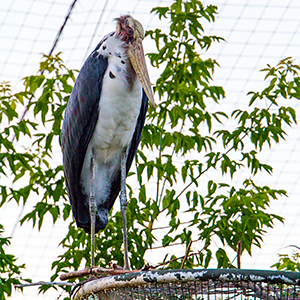 A large stork with an upright stance and a bare head and neck. They have a long, straight pointed bill for catching prey in the wetlands. Their dorsal plumage and wings are black, with a white ventral body. This stork slowly walks along in shallow water or on the ground, looking for prey. Reaching out with its long neck, Lesser Adjutant Stork grabs prey with the tip of its huge, powerful bill.